This is the first new material we’ve gotten from Keifer since Cinderella’s 1994 release, “Still Climbing,” so I was very curious to see how his songwriting has evolved over the years. When I first listened to it, I was amazed by how fresh and current the music sounded without losing the hard rock and blues flavor that made Cinderella a standout in the 80’s hard rock scene. You can’t help singing along to the addictive chorus from the lead single “The Flower Song,” while the coolness and groove of the album’s title track sound like a tribute to “Rocks”-era Aerosmith. Keifer’s wife Savannah co-wrote some of the songs, including “Ask Me Yesterday,” which is a beautiful, country-tinged ballad about reflection, complete with a perfect chorus and a killer lead riff. “Mood Elevator” and “Welcome to My Mind” reach a different level of heaviness than Keifer has given us in the past, while “Solid Ground” sounds like it could have been on any of Cinderella’s records. “The Way Life Goes” is the best rock album to come out so far this year. 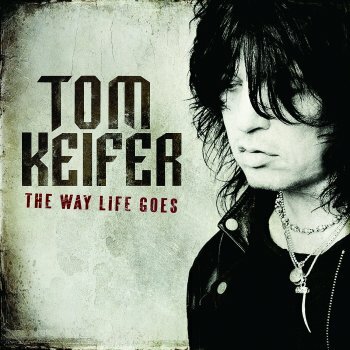 There’s not a bad song on it, and it does a good job of capturing all of Tom Keifer’s different styles and influences. The songwriting is genuine, the guitar rocks, and the hooks will make you want to listen to it over and over. Ignore the trash that most radio stations are force-feeding everyone these days, and listen to this record. You’ll thank me later. I agree with every word! I LOVE this CD!! !